Pharyngula has excerpts from the ruling, or the whole text can be found here (PDF file; I haven’t read the whole thing yet). 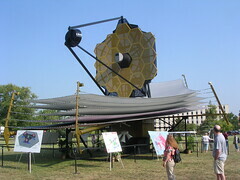 Last week, a full-scale model of the James Webb Space Telescope was installed outside one of the buildings at work. Yikes! It’s huge! Check out the picture for the scale. The mirror is 6.5 meters in diameter and the sun shield is the size of a tennis court, which might sound big, but I never really understood the scale until I walked around underneath it. Science Magazine has published a list of the 125 Questions: What We Don’t Know. How cool is that? One issue that I’ve been discussing with colleagues is the public’s lack of understanding of the process of science. In classrooms, science is taught as though we have all of the answers: gravity holds us to the Earth and sets the planets’ orbits around the Sun, the Earth’s surface is in constant motion as the techtonic plates move on top of the matle, the diversity of life that we see comes from processes of evolution, etc. And while these theories are well-supported, and accepted among all of the science community, by teaching students only the end-product of decades or centuries of debate, discussion and development, the process of science gets lost. In the teacher focus group that I was involved with, we found that high school science teachers are hungry for cutting-edge science in their classrooms. Such science is not typically included in textbooks, because science doesn’t have all of the answers yet, so that textbook writers can’t summarize the results in a nice, neat package. Such cutting-edge science would require updates to the textbooks on timescales that most schools couldn’t afford, or supplements that schools are unwilling to pay for. By not including this cutting-edge, not-neatly-packaged science in the high school classroom, students don’t get to see that science is very much alive. They don’t get to see what they might be able to contribute to science if they decided to pursue science. Most importantly, they don’t get to see science as a process. One hundred years ago, the concept of “other galaxies” had not been considered, because astronomers did not have the techniques to measure distances to objects that far away. Eighty years ago it was thought that the Universe was static — not expanding, not contracting; then, Hubble showed that the Universe was expanding. Ten years ago, astronomers assumed that the expansion rate of the Universe was decelerating, but then astronomers made observations of very distant supernovae that indicated that the rate of expansion was accelerating. What will change in the next 10 years? This is Science Magazine’s #1 question. I’m working with a group to develop a classroom activity that would use dark energy or gravitational waves to show their students the process of science — to help the students understand that science evolves as technology develops and as scientists wrap their minds around new concepts, and that healthy debate is a large part of the science process. Perhaps we aren’t going to change the world with our one small activity, but maybe other scientists and science educators will follow suit. It is imperative that we enlighten the public on the process of science. We aren’t just throwing around hunches that we hope fit the data — we are developing well-supported and well-debated theories to understand the world, and Universe, around us. Felicia presented her poster at the AAS meeting yesterday, so I took a few pictures for her to remember her trip. 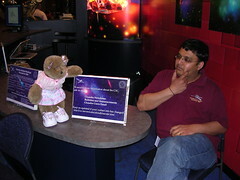 Here she is asking a question about the Chandra X-ray Observatory. 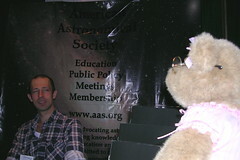 She also stopped at the American Astronomical Society booth to ask about membership. When Felicia passed by the Glast booth, she saw that JD was having some trouble with a Python script, so she stopped to help him out. 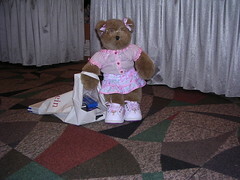 At the end of the day, she had picked up just about every give-away she could find in the Exhibit Hall – she could barely lug her bag back to the car. We’ll post all of her pictures from her big day after we return home next week.